Learn the alphabet, numbers, counting, reading and spelling using sound,pictures and video clips. Using the recognition method young children learn by watching auto rotating lessons. Toddlers learn to use the keyboard. Children progress to type the alphabet. Includes story reading, Flash words and Spelling. Create your own spelling words using your pictures, voice and video clips. Software can be set to US or UK(international) English. Learn the alphabet, spelling and reading using sound,pictures and video clips. ...... Rotating flash word with or without pictures. Spelling words with help, hints or Auto spell which will spell one word or all words in database automatically. If the word is spelled correctly a video is played as reward. Words can be added or deleted to the spelling. With 30 free words and 20 free story pages available to download from the ABC Kid Genius site. Create your own spelling words or names to use with Kid Genius Spelling and Flash Words, using your own pictures, voice and video clips. 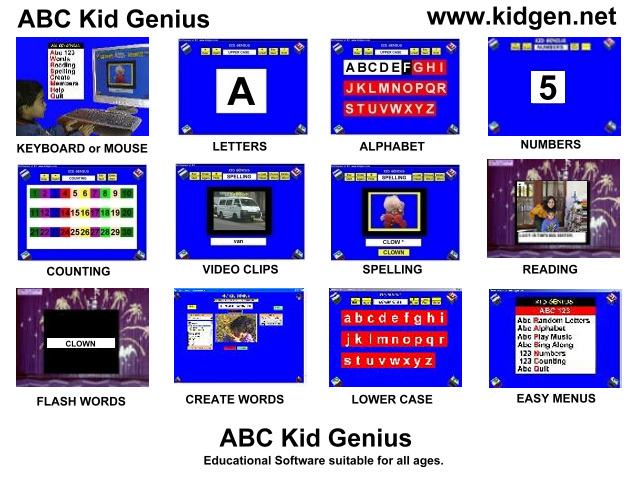 ABC Kid Genius Software can be set to US or UK (international) English. ABC Kids spelling games, spelling activities and spelling games ! Publish up to the minute images on your web page with KABcam webcam software. Qweas is providing links to ABC Kid Genius 5.4 as a courtesy, and makes no representations regarding ABC Kid Genius or any other applications or any information related thereto. Any questions, complaints or claims regarding this application ABC Kid Genius 5.4 must be directed to the appropriate software vendor. You may click the publisher link of ABC Kid Genius on the top of this page to get more details about the vendor.